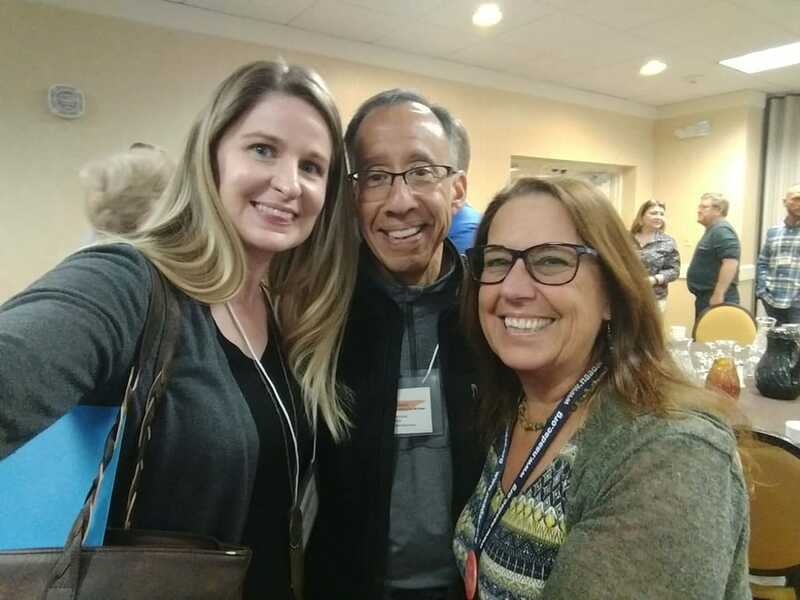 Erin Borden (from left), Wayne Terrazas and Pam Spindel at the 2019 Smoky Mountain Conference of ETAADAC. In November 2016, the hills upon which the Park Vista Hotel towers above Gatlinburg, Tenn., were ablaze. The worst wildfire disaster in a century sent roaring columns of flames marching up the steep hillside. Visitors were trapped, terrified that they were about to perish in the inferno. Miraculously, although 14 people lost their lives in the conflagration, the Park Vista was spared. Gatlinburg, while scarred, bounced back. 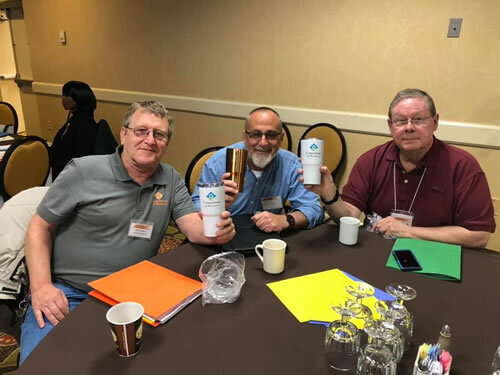 Cornerstone of Recovery counselors Darren "Chappy" Chapman (from left), Chris Brewster and Wallace Smith at this week's ETAADAC conference. Today, there are still reminders of the tragedy: blackened stumps surrounded by new growth, scarred trees towering over the winding drive up to the facility and a barren hillside that’s been bulldozed clear of ruin. It is, in a sense, a rebirth — born of hope, nurtured by determination and a reminder of some of the community’s darkest days. 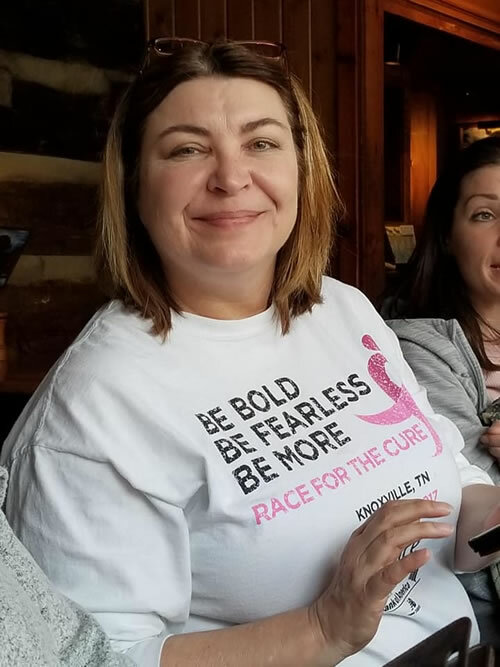 Inside the Park Vista this past week, that process was repeated in reverse at the annual Smoky Mountain Conference of the East Tennessee Association of Alcoholism and Drug Abuse Counselors. In a field where therapists and caregivers often face overwhelming odds, the gathering provided a much-needed spark for those individuals who came from across the area to gain additional knowledge, licensing credits and the experience, strength and hope needed to persevere. McCarter was one of numerous members of the Cornerstone of Recovery family in attendance during this year’s event. She found recovery herself while Cornerstone’s founder, William J. “Bill” Hood, oversaw the residential inpatient program she attended. When he struck out on his own in 1989 to establish Cornerstone, McCarter joined him in August of that year, “helping write policies and procedures in his living room,” she remembers. Aside from a three-year period in which she worked elsewhere, she stayed with Cornerstone through 2003, helping with the development of the institution’s Intensive Outpatient and Support Living programs in her journey from a nurse in Medical Detox to counseling. Today, she’s in private practice with L&M Counseling, based in Knoxville, where she primarily supervises individuals who desire to become licensed addiction counselors. She serves at ETAADAC co-president with Cornerstone IOP counselor Pam Spindel. Cornerstone Newcomer’s Program Coordinator Nancy Dabbs is president-elect of ETAADAC, and while the knowledge she both receives and imparts help make her better at her job, the ancillary benefits of the conference are as important to her, if not more so, than the intellectual knowledge. Throughout the conference, there were somber moments that served as a reminder of just how critical the ETAADAC mission is. More than 70,000 people died from drug overdoses in 2017, speaker Hilde Phipps told the audience on Thursday night. Phipps — the senior director of Addiction Services for East Tennessee’s Helen Ross McNabb, as well as the winner of the McCarter Award (named after Lori’s late husband, recovery advocate Mark McCarter) for ‘outstanding service to the field” — closed out the Thursday evening banquet with the advocation of a simple message: be open to all paths to recovery. During her speech, Phipps highlighted several disturbing figures: Life expectancy in the United States has fallen, in part due to the opioid epidemic, and 1,776 Tennesseans died from overdoses in 2017 — a record high, and up 8 percent over 2016. In the drug and alcohol treatment industry, there are no trade secrets, according to those in attendance at the conference. Each organization has a bottom line to meet, but the nobility of purpose brings individuals to the field for more than just a paycheck. For Wayne Terrazas (another Cornerstone alum), an activity therapist at English Mountain Recovery in Sevierville, every attendee has the same goal, regardless of affiliation. In that regard, the conflagration that consumed the Park Vista this week was a spiritual one, touching all who assembled under the ETAADAC banner as a reminder of what they do, why they do it and who they do it for. “It reignites the spark,” Phipps says.